The Tropical Tiny House sits on a 7’ x 20’ trailer and is approximately 140Sq. ft. A Gable roof runs the length of the house and adds lots of overhead space, perfect for adding an extra loft down the road. The house has 11 windows total, which in a small space, is essential for creating a light and open feeling. As expected, the plan comes with material lists and helpful tips to help get you started on your journey. 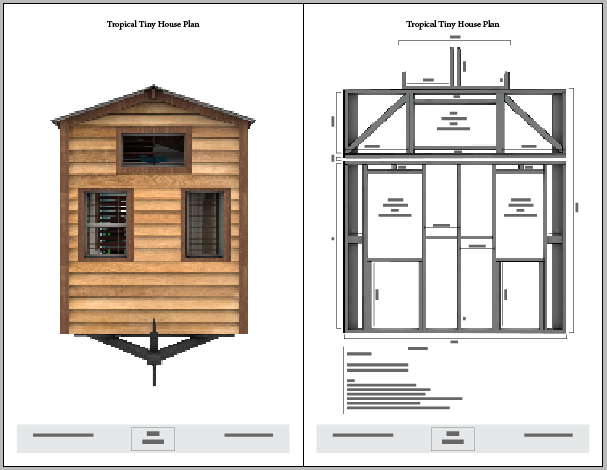 The plans include 29 pages of 3D renders, framing measurements, material lists and tips to help you along the building process. It's easy and fast to get your hands on this new design. Simply Click on the Add To Cart button below. You will then be directed through paypal, and once completed, a link to the plans will be located in your email. Click on the link and enjoy your new plans! We really hope you enjoy the design and we can't wait to hear your inspirational story!